Understanding the patterns and causes of larval dispersal and their consequences for fish populations is a major goal of 21st century marine ecology. Patterns of larval dispersal determine the probability of larval exchange, or connectivity, among populations. In turn, population connectivity has major consequences for metapopulation dynamics and evolution within metapopulations. Further, understanding population connectivity is critical for the design of effective networks of marine reserves and for development of sustainable fisheries. This project entails a a comprehensive, integrated, and potentially transformative investigation of how marine larvae orient in the pelagic environment in order to find suitable settlement sites. It is being done using the neon goby, Elacatinus lori and there are three motives for the choice of study system: i) direct genetic methods have already been used to describe the complete dispersal kernel for this species, and these observations indicate that dispersal is less extensive than predicted by a high-resolution biophysical model; ii) E. lori can be reared in the lab from hatching to settlement providing a reliable source of larvae of all ages for proposed experiments; iii) a new, proven behavioral observation platform, the Drifting In Situ Chamber (DISC, pioneered by Dr. Paris), allows measurements of larval orientation behavior in open water. This collaborative project has three objectives: 1) to understand ontogenetic changes in larval orientation capabilities by correlating larval orientation behavior with developmental sensory anatomy; 2) to analyze variation in the precision of larval orientation in different environmental contexts through ontogeny; 3) to test alternative hypotheses for the goal of larval orientation behavior. The late stage larvae of coral reef fishes are known to respond to olfactory, auditory and/or visual cues during navigation and/or settlement. It is known that fish larvae can swim directionally at rates faster than prevailing currents, but the way in which larvae of any one species orients (from hatching to transformation and settlement) has not been investigated. However, the anatomy and function of individual sensory systems has only been examined in a limited number of coral reef fish species. We are carrying out the first integrated study of the ontogeny of multiple senses and larval orientation behavior, and the first such analysis of the sensory biology of a member of the family Gobiidae, the largest family of reef fishes and one that is a critical component of coral reef fish communities. Sensory anatomy of Elacatinus lori settler (9 mm SL). a) Olfactory organ is blind sac with olfactory epithelium (oe), and one of two nares (n) visible. Oral valves (v) in buccal cavity (bc) bounded ventrally by mandible (md). b) Flat olfactory epithelium (oe) with superficial neuromasts (sn) and cupular remnant (blue); c) Eyes with retina (r), lens (l), iris (ir), cornea (c); medial supraorbital LL canal grooves (so). d) Inner ear, lateral to the hindbrain (hb), showing semicircular canal (sc), otolithic organ (saccule, sa), and innervation by auditory nerve (VIII); distance between asterisks indicates otolith size (dissolved in prep.). e) SEM of mandible (ventral view) with neuromasts (arrows). Inset = neuromast with hair cells and orientation (arrow). f) Example of DASPEI-stained neuromasts (dorsal side of head, E. lobeli adult). Scale bars: a, c, d = 100 µm; e = 100 µm (inset = 2 µm), b = 50 µm, f = 1 mm. Methods: Histological analysis, vital fluorescent staining, scanning electron microscopy (SEM), µCT imaging, and gene expression studies are being used to study the development of the olfactory, gustatory, auditory, lateral line, and visual systems. Katie Nickles – MS student (Fall 2017-Summer 2019; BS in Marine Biology URI) – Development of the lateral line and visual systems in Elacatinus spp. Katie Nickles (Marine Biology major, URI) – Summer 2016 – August 2017 – Development of mechanosensory lateral line system in Elacatinus spp. Elizabeth Molnar (Marine Biology major, URI; CELS Coastal Fellow) – Summer 2018. Fluorescent imaging of the lateral line system in fishes with neuromast proliferations for comparison with gobies. Alec Mauk (Marine Biology major, URI) – Summer 2018. Image analysis of goby neuromasts. Hu Y, Majoris JE, Buston PM, Webb JF. 2018. Potential roles of smell and taste in the orientation behavior of coral-reef fish larvae: Insights from morphology. Journal of Fish Biology – Special Issue on Sensory Ecology of Fishes. 10.1111/jfb.13793. Foretich MA, Majoris JE, Chaput R, Di Persia CL, Schlatter E, Webb JF, Buston PM, Paris CB. 201_. Does larval fish orientation behavior depend on ecological context? Submitted to Proc. Roy. Soc. B (July 2018). Hu Y, Majoris JE, Buston PM, Webb JF. 201_. Development of the ear in a goby . In prep. Nickles KR, Hu Y, Majoris JE, Buston PM and Webb JF. 201_. The lateral line system of a Caribbean reef goby, Elacatinus lori: Ontogeny and interspecific comparisons. In prep. for Copeia. Majoris JE, Foretich MA, Hu Y, Nickles KR, Di Persia CL, Chaput R, Schlatter E, Webb JF, Paris CB, Buston PM. 201_. Coral reef fish larvae can orient soon after hatching. In prep. for submission to Current Biology. Webb, JW. Sensory ontogeny in fishes: It’s all in the timing. Ecology and Evolutionary Ethology of Fishes, Tallahassee, FLA. June 2016. Hu Y. and Webb, JF. Ontogeny of the olfactory and gustatory systems in Elacatinus spp. (Gobiidae): Potential for chemosensory-guided navigation in pelagic larvae? Joint Meeting of Ichthyologists and Herpetologists, New Orleans, LA. July 2016. Hu, Y, Majoris, JE, Buston, PM, and Webb, JF. 2017. 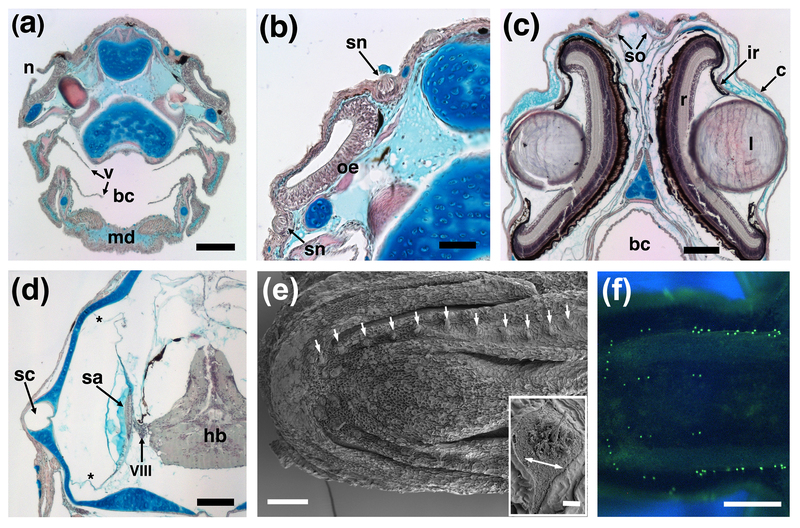 Development of the nose and internal taste buds in two species of neon gobies (Elacatinus spp): Potential to facilitate navigation of pelagic larvae. SICB, New Orleans, LA. Integrative and Comparative Biology. In Press. Nickles K, Hu Y, Majoris JE, Buston PM and Webb JF. 2017. Ontogeny of the Lateral Line System in a Caribbean Reef Goby, Elacatinus lori. ASIH/JMIH annual meeting – Austin TX July 2017. Hu Y, Majoris JE, Buston PM, and Webb JF. 2018. Ontogeny of the ear in larval and juvenile coral reef fishes (Gobiidae, Pomacentridae, Apogonidae). Joint Meeting of Ichthyologists and Herpetologists. Rochester NY, July 2018. Nickels KR and Webb JW. 2019. Does habitat predict lateral line morphology among species of neon gobies (Genera Elacatinus and Tigrigobius)? SICB, Tampa, FL Jan. 2019. Jones A and Webb JF. 2019. The Lateral line system of larval brook trout, Salvelinus fontinalis: Early indications of life in flowing waters. SICB, Tampa FL, Jan. 2019. Molnar, E and Webb JF. 2019. Elaborations of the lateral line system in tetras (Family Characidae: Order Characiformes). SICB, Tampa FL, Jan. 2019.